I'm excited about blogging again and do you know why? Because I just made something to share. Garbanzo beans, roasted in my Easy Bake Oven, with olive oil, Hungarian Paprika and Kosher salt. Oh my goodness, these are so flippin' good, that I got excited to write an evening post. And show you the pictures. Meanwhile, if you read my last post you know I'm on Frump Patrol today. And it has served me well because I feel relaxed. An even though I only did laundry, bills, couponing, bake and make dough, I still feel productive. Keep in mind, for me, that's a light day and I did it all in my ugly old robe, ratty pink slippers, with the ugliest hair you ever did see. But I don't care. Know why? Because I feel refreshed. Plus, tomorrow when I shower and get dressed, I'm gonna look like a beauty queen by comparison. Anyway, below is the picture, along with method and ingredients. I cannot wait to make these again. This is one fun treat and, it's enough to put me off salty crispy crappy snacks, for good. And by the way, Frump Day rules. I drained a can of beans, removed the skins (though I might keep them on next go), and patted them dry on a bake sheet. Then I added a bit of olive oil (not virgin), and some Hungarian paprika and Kosher salt. Gave them a mix and in a fan oven at 350F/180C. Keep in mind I have a teeny tiny counter fan oven. So adjust as needed. During their bake, I tasted them several times, taking care not to burn them. When they hit the crunch I wanted, I pulled them out and added, to taste, Kosher salt and a whisper of good strong cayenne pepper. Cooled them on a big clean plate and that was that. Next, I want to do a cinnamon sugar crunch and maybe down the line a chocolate or salted caramel. I'm not much for garbanzo beans, but I bet those were tasty. If you don't like the beans, you may not like these because they are hard, crunchy and burn easily. And somewhere in there, even with seasoning, I still taste the garbanzo, but I love them, so it's different. Those look sooooo good! I am on a garbanzo bean kick at the moment - I just picked up 4 cans. So I will have to try these. Mmmmmmmm.... Awesome! Woohoo to the garbanzo bean. So fun. Crap, I just bit the side of my lip eating the last of these little things. I can't wait to do a cinnamon sugar one. PS: Tim didn't like the taste or texture but they are right up my alley. Can't wait to see what you think. PPS: Did you ever mash up the bean with some onion, celery and mayo? I love that combo. That's back from my VegHead days. And that's just it. So many options. Today I took the last 11 beans and smashed them to bits. I bake with garbanzo flour but now ... I'll just make my own. Why not? Mmm. You need to package and market those. I told my girlfriend today that these would be nice in a fancy jar, as a gift to someone. Never had them?? Are they nutty? Not so much but sorta. They are dryer than a peanut, and crunchier. There's a little chick pea taste under the seasoning. Tim didn't like the texture or the taste, but for me, these little things are heaven. Eating the last of them now. Now that you say that, they do look like doughnuts. I'm eating the last of them now. I love these things. Thanks for stopping by. Another name they go by is, Chick Pea. And Kosher salt, the one I use anyway, adds a nice texture and flavour so good, that I have to put a U in it. Meant to say they look tasty though! I've never heard of garbanzo beans. Same thing as a chickpea. Only I can't remember if chickpea is one word, or two. I was about to say the same. I do know what a chickpea is. I would love to see your photos of the rum cupcakes. I've never used alcohol yet in any of my bakes, but see them do it on Cupcake Wars. 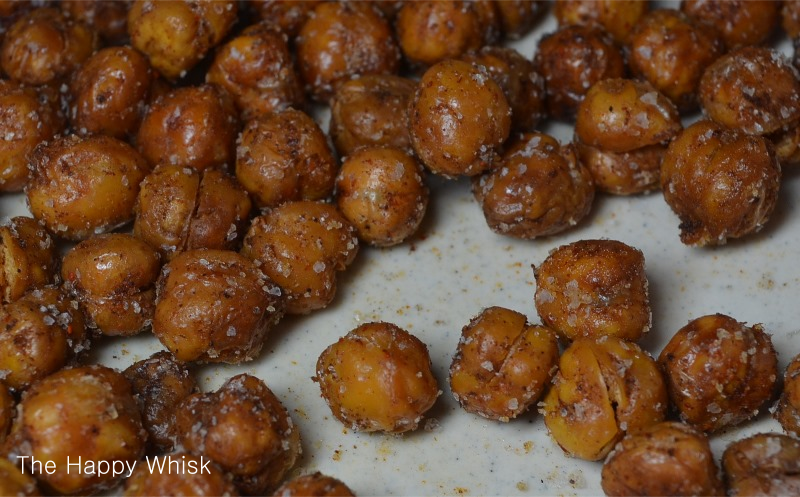 Garbanzo is also called a chickpea. ahhh. I do know what chickpeas are :) Have you ever tried to boil them yourself or do you buy them only canned? I'd love to try to make humus but I don't have experience in cooking chickpea. I absolutely LOVE fresh garden beans the best, but I don't have any of those right now. Dried ones from the store aren't bad to work with either but these canned organic ones, I got for almost free with coupon and sale. So ... I work with what I have. I hope that you give cooking with chickpeas a go. This is how we learn. And, it's fun. Just opened a can of Habichuelas Romanas (Roman Beans). Got them nearly free at the market. Never tried them but they reminded me of the Rattlesnake beans I used to grow and eat for breakfast with rice. Going to see if I can make these ones into a cinnamon sugar crunch. Can you grow your own beans? They are sooo yummy and if you use steaks to let them climb, they don't take up all that much space. That is best way. So yummy, lots of work, but so yummy and fun to have our own ingredients. Where I live, all but one market does local produce, from local farmers, come in-season time. Then we have Farmer's Markets pop up everywhere, plus one that stay year-round. But I agree, nothing like real earthy veg from our own soil. So flippin' good. I love chick peas in salad and soup...never tried them as a treat! I loved them, they were spicy and salty. My husband didn't like the texture or the taste. For me though, the texture is this nice solid crunch and the spices were fun. Next up, a cinnamon sugar crunch. Just gotta try it. I have never seen garbanzo beans prepared this way, but they sure look good! They were crunchy and wonderful. To me. My husband didn't like the texture and taste. But I loved them. Making another batch now using a different bean. Friday Question: Have You Seen This Show?